Administrator's deeds are used to transfer title to real property when the owner died intestate (without a last will and testament). The Surrogate's Court appoints an administrator to distribute the deceased individual's estate according to the rules set out in section 4-1.1of New York's Estates, Powers, and Trusts Law (EPT). The surrogate (the judge managing the case) issues documents called letters of administration, authorizing the administrator to begin his/her duties. If the estate includes real property, those duties could include using an administrator's deed to sell it. Administrator's deeds contain the same information as warranty or quitclaim deeds, but they also include details about the administrator and the deceased owner. The administrator acts as the grantor on the deed, and his/her signature must be notarized. Some cases may require a witness to sign the deed in front of the notary, too. 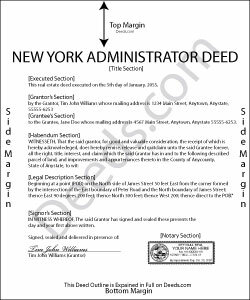 Note that at sections 309-a and 309-b, New York's Real Property Law (RPP) sets out specific notary statements based on whether the deed is signed inside or outside the state. In addition to the standard state and local forms that accompany deeds submitted for recording, administrators might need to attach letters of administration from the Surrogate's Court, certified copies of the decedent's death certificate, and other supporting documentation as appropriate. Depending on the circumstances, the sale might also require court approval.